Mega Man remains iconic a quarter century after the blue robot bombed the NES in part because his games were made of nothing but icons. The characters were simple and strange, fulfilling clear roles in a mechanical world of fantastical utility. Consider Elec Man in his massive vertical power station: one robot master, one function. Each automaton had big colorful heads, and they lived in angular cartoon places full of clockwork vitality, every part distinct and instantly recognizable. Inti Creates, a studio founded in the ’90s by Capcom expats, has always struggled with Mega Man’s iconography. As stewards of the series in the 21st century, they produced the ingenious Mega Man 9 and 10, which handily distilled the powerful simplicity of the originals. On the other end, they made the Mega Man Zero and Mega Man ZX series, both excellent but mired in extraneous story, action ticks, and garish anime art. Somewhere between the emblematic clarity of the originals and the bloated melodrama of its latter day spin-offs lives Inti Creates’ Azure Striker Gunvolt, its new original game for Nintendo 3DS. If it seems strange to discuss Mega Man history in such depth if Gunvolt is an original recipe, check the ingredients. The titular character may be an Adept fighting the evil Sumeragi Group rather than a Maverick Hunter fighting Sigma, but he’s still a blue dude walking from left to right, jumping over spikes and bottomless pits while shooting robots on the way to major encounters with more powerful, primary-colored robot masters. Beg your pardon—not robot masters, just primary-colored evil Adepts full of “Septimal” power they use to dominate the Quill resistance. Inti Creates can pour as many confusing proper nouns into Gunvolt as it likes, but it can’t mask the game’s lineage. It’s all there: the multi-boss structure of the originals, the theatrics of Mega Man X, the blocky characters of Zero and ZX. Gunvolt even fights a riot shield-wielding anti-hero rival. For everything blue, borrowed, and old in Gunvolt, it does deserve accolades for how it twists those formulas into something so different. Just shooting evil robots with bolts from Gunvolt’s handy pistol won’t hurt anybody. 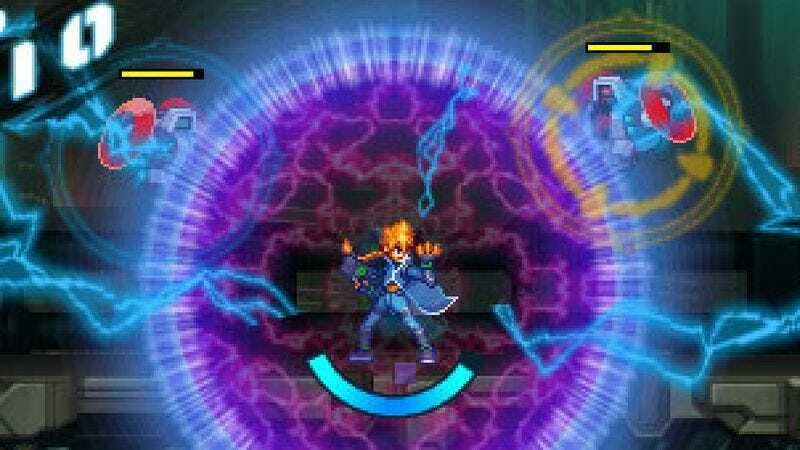 You have to use his signature skill, which has Gunvolt unleashing a storm of electricity that surrounds him like a bubble and sends the current through any enemy within the sphere, provided they’ve been tagged with a shot from your pistol. The storm isn’t infinite, though. It’s limited by a meter that runs out quickly but can be refilled by waiting or standing still and tapping a button. Success requires mastering the flow of tagging enemies and shocking them, balancing your offense with the vulnerability of recharge time. Defeating bosses unlocks new bolt guns that let you do things like tag multiple enemies, and building up combos earns you greater points to level up Gunvolt and unlock screen-clearing special attacks. As a riff on the Mega Man structure, Gunvolt excels where successors like Mega Man Zero failed, keeping the action swift and free of needless complexity. Rushing through an underground research facility full of undead apish freaks and sparking your electricity field to keep the place lit—all while trying to tag enemies and keep your combo building—feels as fluid and entrancing as taking on Metal Man in Mega Man 2 but just different enough to overcome its familiarity. Lingering ticks from the developer’s series like Mega Man Zero—such as secondary missions to earn new gear or stretches of impenetrable, jargon-laden dialogue—are incorporated more seamlessly here. At no point does it feel like you’re missing part of the game if you’re just tackling levels and fighting through, relying on reflex to persist. While Gunvolt nails the pace, it loses some of the satisfying crunch of the classics by shifting its priorities. The direct approach of blasting through levels and surviving to the end is actually pretty easy. Even though Gunvolt has the same acrobatic skills as his ancestors—dashing and jumping off walls like old Zero—there’s little dangerous terrain here. Most levels, even those toward the end of the game, are free of life-ending perils and pits. What is hard, however, is not getting hit while keeping the combo meter stacking up. The combo meter is explicitly emphasized. Build it up to 1,000, and Gunvolt’s ward, Joule, starts singing a crazy J-pop song. (If you want to get as specific as the game does, it’s Lumen, the freaky butterfly-winged pop star that lives inside Joule, who starts singing.) The song’s the first reward, and a higher score and more new equipment come next. Focusing on high scores and flawless fast runs through levels is a perfectly valid way to build a game. In fact, it’s a smart recognition of how people today play old Mega Man games, emphasizing speedrunning and tricks rather than standard playthroughs. Gunvolt’s world and characters don’t reflect that kind of thoughtful focus, though. The bosses, enemies, and levels themselves are created in such a way that they don’t force mastery of building the combo meter, nor do they force you to build up ferocious reflexes and pattern recognition like Mega Man games did at their best. Enemy placement and level layout feels more meticulous than the artistic design, which certainly emphasizes the score-building hook but doesn’t make the game, its characters, or its locales more memorable. Save for a few moments like a blacked-out lab, an encounter with a pair of crazed twins, and Gunvolt himself, little in the game is as iconic as Inti Creates’ previous work. Azure Striker Gunvolt is one of only a few original games Inti Creates has made since it opened shop in 1996, and while it stands far above curios like Speed Power Gunbike for the PlayStation 1, it doesn’t rise above the Capcom series it’s most intimately associated with. An arresting modernization of Mega Man’s pace is an achievement in and of itself, but without the structural vision of its iconic predecessors, Gunvolt is merely classical rather than classic.